On the weekend of October 27 to 29, Stan Lee's Los Angeles Comic Con (AKA Comikaze) returned for 2017 with more guests and big name celebrities. Huge popular draws such as Dwayne "The Rock" Johnson appeared on the main stage filling the floor with a full house of film fans. Other celebrities included Chloe Bennett (Daisy from Agents of Shield), Melissa Joan Hart (Sabrina the Teenage Witch), Paul Rueben (Pee Wee Herman), Katee Sackhoff (Starbuck from BSG), The Black Eyed Peas, Rob Liefeld (Deadpool creator, Image Comics co-founder) and more. Following Phoenix Comic Con's weapons policy ban, in light of recent events (the mass shooting at a Las Vegas concert) and other examples, LA Comic Con is the 2nd convention in southern California to ban prop firearms, the first was Long Beach Comic Con in early September of this year. Weapons and bag checks were mandatory, making security a top priority. So without LG's to dispense justice, the judges of MC02 had to fend off violent perps with batons and hand to hand combat. It looks to have been an amazing zero fatalities, with the death sentence on hold for the lucky offenders. Iso cubes filled up fast. To assist the outnumbered local street judges,the MC01 Justice Dept sent it's top judges, Dredd and Anderson to shore up security detail on Saturday. See the surveillance photos at the button above for a glimpse of Saturday's judge patrol. On what was traditionally tax day, April 15, 2017, the SoCal RPF held it's annual 2017 Prop Party in North Hollywood at Frank Ippolito's SFX shop. Organized by Brad Fyfe, this exclusive event was hosted by Frank for the 3rd year and was held a couple months earlier due to work schedules and cooler weather. For those not able to attend the Star Wars Celebration in Orlando, which was also taking place that same week, this was the perfect way for those trying to cope with missing it! Norman Chan and Tested.com returned to interview members and record the event. 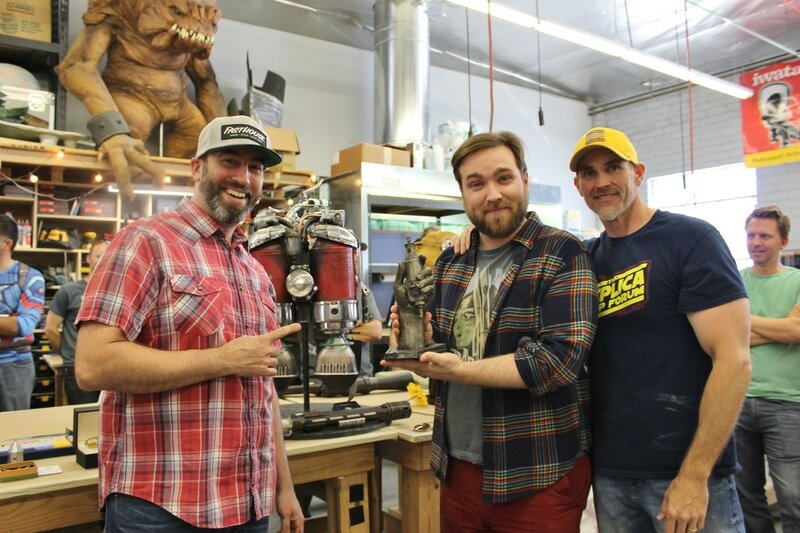 Matterhackers displayed some of their latest projects, and special celebrity You Tube guest Chris Stanley - "Cosplay Chris" attended. Reynolds Advanced Materials generously raffled off prizes throughout the day. And of course the party wouldn't be the same without the World's Largest Deliverable Pizza by Big Mamma! Frank showed off his new 3D printers, raffling a huge 3D print of the old style RPF logo shield, which had printed out in a matter of hours. New this year, Brad and Frank presented the 1st of it's kind - a special RPF Rusty Dremel Award. The 2017 award went to Nick Tierce for his amazing Tomorrowland Jetpack. 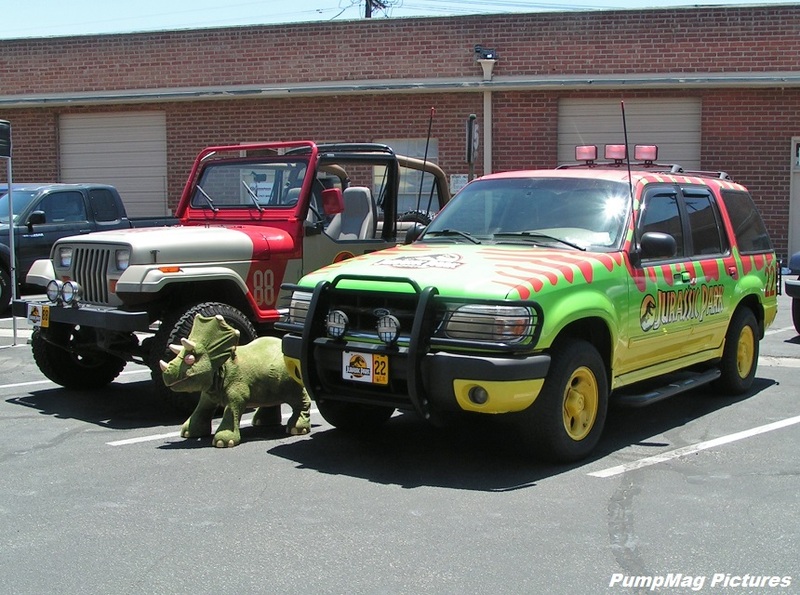 An array of various movie and TV replica vehicles drove in for display: a Herbie VW Bettle, a Pixar Pizza Planet Toyota Delivery Truck, a Jurassic Park Jeep, a BTTF Toyota Marty Mcfly Pickup Truck complete with BTTF replica props, and an Austin Powers Jaguar. And for Star Wars fans, there was a Sith Princess Leia Cosplay by Juli Miller in her original dark spin on the beloved character, 2 fully operational mouse droids, and a not yet complete but fully articulated life size K-2SO from Rogue One puppeteered by it's owner/builder Darren Moser. Towards the end of the day, Michael Senna delighted the crowd with his amazing Wall-E droid! Not your typical Easter Saturday! To see the full gallery of photos click on the button above. BTTF fans visit "Hill Valley" on November 5, 2016 to celebrate the date that Doc Brown invents the "Flux Capacitor" and when Marty McFly time travels to 1955. ​On November 5, 2016, a small group of dedicated fans gathered to visit "Hill Valley" as seen in the film "Back To The Future". It was on November 5, 1955 in the film that Doctor Emmitt Brown came up with idea of the "Flux Capacitor" that made time travel possible. It was also the day that Marty McFly arrived back in time to 1955 Hill Valley in Doc Brown's DeLorean Time Machine. Starting at 4:30 pm BTTF fans met up in Burbank, CA at the Victory Blvd Burger King for an early dinner and for a group photo outside the restaurant parking lot where Marty McFly exited Doc Brown's garage laboratory in the opening scene. Racing against time, the BTTF fans departed Burbank at 5:30 pm to the next location site before the sun set, to take full advantage of remaining daylight to see the neighborhood homes of Lorraine, George McFly and Biff Tannen. The fans went full fandom as they took photos to recreate Marty's accident near the tree when Marty saves George from being hit by Lorraine's father. Next the fans drove in caravan to the Gamble House in Pasadena which was the location site of Doc Brown's mansion. By this time, it was completely dark, so photos were a challenge with lack of light, yet the fans improvised and got some decent shots. To see photos from this event click on the button above. For 2016, Comikaze Expo has been renamed as Stan Lee's Los Angeles Comic Con. The event was held on Halloween weekend of October 28 through October 30. This is the 6th year for the comic book and pop culture gathering and the name change reflects the growth of the convention. There was plenty of gridlock and traffic congestion as attendees that braved driving to the event spent insane time trying to navigate parking for the con each morning. Once agian Judges were dispatched by the MCII Hall of Justice to secure the site. Patrols consisting of single judges, 2 or 3 man patrols, with as many as 5 judges seen on duty on Saturday. With the need for more judges to tackle the increasing crowds, the Justice Academy has been busy assigning its best and brightest rookie cadets to active duty in the area. Check out the youngest judge cadet in action in the most recent field ops surveillance photos. 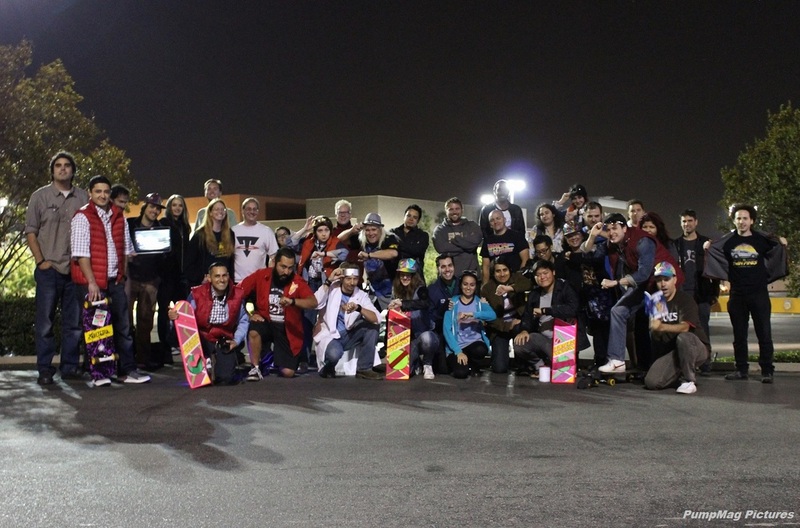 At 1:15 am on October 26, 2016, "Back To The Future" fans gathered at the "Twin Pines Mall" (Puente Hills Mall filming location) in annual tradition to celebrate the arrival of Marty McFly (Michael J Fox) where he meets up to see Doc Brown's (Christopher Lloyd) DeLorean Time Machine (1:15 am, October 26, 1985). Dedicated fans dressed up in BTTF costumes, brought prop replicas, and there was also a fan built DeLorean Time Machine! The group swapped stories, took photos and had a great time. To see pictures from this event press the button above. The 2000th issue signing of 2000AD Comic at Meltdown Comics, Los Angeles, October 1, 2016. Photo of Judge Dredd costumer with cover artist Chris Burnham. On Saturday, October 1, 2016, 2000AD celebrated the 2000th issue of 2000AD Comic Book. Store locations across the globe had special event signings with artists and writers for this milestone issue. Signing locations were held in London, Eastbourne, Shrewsbury, Manchester, Edinburgh, Wales, Ireland, and Australia. The official USA signing had cover artist Chris Burnham at Meltdown Comics in Los Angeles. Known for his artwork on Batman Incorporated with Grant Morrison, Chris is also co-creator of Nameless, Officer Downe, and Nixon's Pals. Chris got the unique opportunity of a lifetime to create Judge Dredd art for one of the 3 available covers of the Prog 2000 issue of 2000AD.The other covers featured art by Cliff Robertson and Glenn Fabry. It's rare for an American artist to draw for the British publication, but Chris is no stranger to the book having drawn Judge Dredd previously for the FCBD 2000AD issue in 2014 and he's drawn cover art once before for Prog issue 1950 in 2015. Within 48 hours after the release of the landmark 2000th issue of 2000AD, the book sold out in stores and online. A second print has been ordered which is the first time to happen to any of 2000AD's issues. In 2017, 2000AD will be celebrating 40 years of the "Galaxy's Greatest Comic" with a one day event held in London in February. For more info about 2000AD or artist Chris Burnham go to 2000adonline.com or ChrisBurnham.com. For more photos click on the button above! The 2016 RPF SoCal Prop Party returned to Frank Ippolito's workshop in North Hollywood on Saturday, July 9, 2016. Organized by Brad Fyfe, this was a must go event for members of the Replica Prop Forum. RPF member and professional prop maker and special effects artist, Frank Ippolito had moved his workshop to a larger facility, thus giving the event even more space for RPF members to show off their replica projects and collections. With so much more space, there was room for Frank's track motobikes and a couple of fully functional coin op arcade games which were free to play for attendees. Norm from Tested.com was interviewing members and recording the event. Also in attendance was popstar music sensation Emii who had brought cupcakes. She got a lucky day off from her busy schedule touring from her new album. Licensed replica costume maker, Dana Gasser from Anovos was there visiting. Smooth-on Products returned and had a lot of prizes that they raffled off away throughout the day! Star Wars was a dominant theme. Many fans wore Star Wars themed T-shirts for the warm sunny Calfornia day. A special feature of the event was Frank's surprise project, a frozen Han in Carbonite functional refrigerator that had a fading red thermal glow complete with cold beers and soda. A huge highlight of the day was Gordon Tarpley's appearance as "red C3PO" accompanied by William Miyamoto's "Chopper" Astromech droid. Gordon had the moves and voice that would make you believe it was Anthony Daniels under there. Kids and adults were in awe! New this year, were future generation RPF members in attendance (children of RPF members were allowed). William's daughter got into character, wearing components from her favorite cosplay - Baby Predator helmet with shoulder armor and from her most recent costume, a BB8 custom helmet. Of course the day couldn't be complete without an epic display of movie and TV replica vehicles: BTTF DeLorean Time Machine, 1982 KITT from Knight Rider, Pixar Pizza Planet Toyota Delivery Truck, and Jurassic Park vehicles. Also the timing couldn't be more appropriate so close to the new film release, when an ECTO1 Ghostbuster Hearse arrived to the party! For more pictures click on the button above! After being postponed the weekend prior due to rain, the 501st Southern California Garrison held a one day symposium on Sunday, March 13, 2016 at Brea Olinda High School. Often called "armor parties" by Star Wars 501st Costume members, this has been the largest attendance the group has seen in it's recent history. With many new builders having received the first ever newly released Anovos TK kits after many long months of waiting, this was a unique opportunity to learn and ask questions on how to properly build their stormtrooper armor to meet 501st standards. Experienced 501st members were on hand to answer questions and assist the new recruits, who had brought their kits in various stages. For some builders, this was the first day of building while for others were at various fitment and build stages. One member had just fully completed the kit and after a few adjustments was approved for membership. Sample armor was on hand, most notably a Centurion level movie accurate suit that was screen matched down to the screw hinges. 3 Power sander stands were on hand to make rapid touch ups for shaping and sanding parts and pizza was available to keep the energy going. As the next Star Wars film release approaches, you can bet the Empire will have the force in huge numbers! A big thanks to the Southern California Garrison for this TK build day! For more pics click the tab button above. 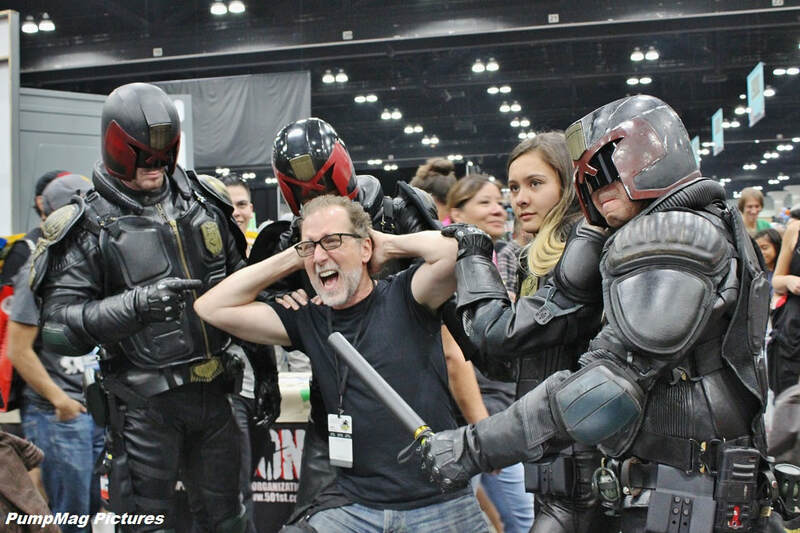 The Mega City II Hall of Justice dispatched a squad of Judges to patrol Comikaze Expo 2015 during Saturday, October 31, 2015 at the Los Angeles Convention Center. With a record 62,000 attendees and on one of the busiest days of all - Halloween day, the overwhelmed law officers still managed to keep order. With the audience nearly doubled in size of the first Comikaze Expo in 2011, the event had been expanded to 2 halls this year with South Hall housing the props and vehicle displays, cosplay booths, autograph tables, celebrities and Main Stage. The West Hall contained the vendors, comic book creators, artist alley and the main celebrities, Stan Lee and Elvira. Celebrating the 250th comic book realeased of Marvel's Deadpool character, COMICS VS TOYS Comic Book Store in Eagle Rock, CA hosted a store party on Saturday, April 11, 2015. MC'd by DeadPool Costumer "D-Piddy", it was a day of fun, food, raffles, and a costume contest. There was a good sizeable crowd that attended to celebrate the "Death of Deadpool", including fans in incredible costumes! The top costume went to Spider-Man, who won by a unanimous vote by the Judges for his amazing resemblance of the Amazing Spider-Man 2 movie with the large McFarlane inspired comic book style eye lenses. He was awarded a Deadpool Funko action figure and a store gift certificate. With Spider-Man and Deadpool in attendance, you can bet plenty of shenaningans were had to entertain the crowd. Raffles were also pulled for those who purchased the Deadpool #250 Comic. Prizes included for 3rd - A $25 store gift certificate, 2nd - A Marvel Select Deadpool Action Figure, 1st - A Deadpool ARTFX Kotobukiya statue, and for the Grand Prize - A full set of Deadpool #250 variant comic books. Check the gallery button above to see exclusive photos of the event! for those who had worked on the film. I got to meet with a few of the prop & costume replica makers and took plenty of photos, including a fully functional WALL-E. There was also a panel held by the 501st for Star Wars Costume fans, especially for those who prefer the dark side of the saga. There were plenty of comics and other cool stuff for sale at the various tables. Outside the convention, there was a bicycle meet, I swung by to check it out and snapped a few pics there too. In conjunction with American Cinematheque, EW experts Geoff Boucher and Jeff Jensen host some of fandom's favorite films of the last 30 years followed by Q & As with special guests, directors, and actors including John Carpenter, Terry Gilliam, Leonard Nimoy, Kurt Russell, Noah Wyle, Mark Hamill, and many more. Several films sold out long before their screening day, namely Escape From New York, Return of the Jedi, and STAR TREK. Check out my exclusive photos of Noah Wyle & cast from Falling Skies and Kurt Russell from Escape From New York. give-aways, and special surprise guests. The marathon did include food and drink, but I missed out on catching Stan Lee with my camera when he briefly appeared on stage before the first film. I got plenty of pics of the costume contest and managed to snap pictures of actor Clark Gregg (Agent Phil Coulson in AVENGERS), director Shane Black (IM3) and young actor Ty Simpkins (Harley Keener in IM3). Stan Lee's personal collection was on display along with the finalists' displays for the IM3 Inventor and Innovations Fair. Also Madame Tussaud's wax figure of Tony Stark from IRON MAN was on hand for photo ops. Overall a fun event for those brave enough to see all 4 movies straight through in one sitting! To celebrate the 27th year, WonderCon returned to the Anaheim Convention Center with more dealers, booths, and panels on Easter weekend next to the big mouse home of Disneyland. With over 700 exhibitors and 250 hours of programs available, there was no shortage of entertainment. The theme this year was 75th year of Superman. Jim Lee penciled the iconic Superman art for this year, with Scott Williams inks and Alex Sinclair colors. Souvenir WonderCon 2013 T-shirts with the Superman cover art completely sold out! On Friday, I went to the Star Trek Enterprise Brigde Retsoration Project Panel. Huston Huddleston and Brian Ulga discussed how they rescued the Enterprise Bridge set used in Star Trek: The Next Generation tv series from destruction. With the help of the original set designers, they are now restoring the set and creating the world's first interactive, educational Sci-Fi Musuem. I returned on Saturday, using my small backup camera and again resorting to my cell phone that evening at the costume contest when my batteries died. The Masquerade Contest was moved to the Arena, which provided better viewing for those attendees in the back who now have balcony seats with great views of the stage. I got close up seats towards the front but my pocket cam and cell phone couldn't handle the low light and movement, so please exucse the motion blur! Also on Saturday, Tony McVey made a rare appearance. With over 40 years of experience in visual effects-related art and design, Tony had worked as a character designer, sculptor, and puppet, costume, and prop maker for projects such as Superman, The Dark Crystal, Return of the Jedi, Star Trek 3, Gremlins, Phantom Menace, and Attack of the Clones to name a few. Sunday with my camera up and running finally, I got to walk the exhibit floor. There were tons of cool stuff especially from the smaller booths and I have some cool snapshots of a few celebrities and artists you might recognize. This year also celebrates 35 years of Battlestar Galactica. Check out my reunion pics of Anne Lockhart (Sheba) with Richard Hatch (Apollo) and Herbert Jefferson Jr. (Boomer). And lastly, I have plenty more pictures of awesome costumes and cosplayers! Returning to the tropical tourist playland of Florida, STAR WARS Celebration VI stormed in force to the sunny and at times rainy city of Orlando in late August 2012. There, fans from near and far assembled to join the biggest STAR WARS event of the year. For four days, celebrants gathered at the Orange County Convention Center to share their passion for the science fiction saga. Enthusiasts could find an incredible array of activities and interests that spanned all areas of the franchise: Costumes and Cosplay, Droids and Props, Celebrities and Panels, Collectibles and Toys, Books and Games, Animation and Films, Exhibits and Artwork. Click the button above to see more from a galaxy far far away. With San Francisco's Miscone Center undergoing renovations, the 25 year old convention WonderCon relocated to Anaheim, California in March 2012. With Disneyland nearby, it was an easy destination spot for Easter time vacationers. A sister show to Comic-Con International, WonderCon ran familiar in format for 3 days from Friday to Sunday. A smaller crowd to navigate and with shorter lines to stand in, the relocated event was a welcome change to veteran SDCC attendees who often have to wait long hours to see scheduled panels. There were plenty of costumers that dressed to impress, including a costume contest on Saturday, and it was nice to be able to visit the exhibitors without feeling like you were trapped in a crowded subway train! I got to see some of the smaller booths and talk with a lot of unique vendors. Be sure to check out photos that I took showcasing many of the great products on display and yes ---- plenty of pics of fantastic costumers! Replica Props large and small from BSG credits to fully driveable Time machines were on display by collectors & builders from the RPF forum. An all day event with food and good company was held on March 25. If you know your movies and TV shows, you'll love the details that these enthusiasts put into their props and costumes. Buy, build, trade, or collect, these replica props are as close as you can get to having the real thing. And yes, there were a few real screen used props too!